Ever since I started blabbing about my double-wide Parallelogram Scarf, I’ve been fielding questions from knitters. How many stitches did I cast on? How wide will it be? How many skeins will it take? How long will it be? Here are some notes on my research so far into this topic. I think I’ve made a rather startling discovery: you can get a wide Parallelogram Scarf out of only two Freia Shawl Balls. I know! Caveat: if you want to make a wider version of the Parallelogram Scarf from two Shawl Balls, heed the following information so that you can adjust the width/length of your scarf to your liking. 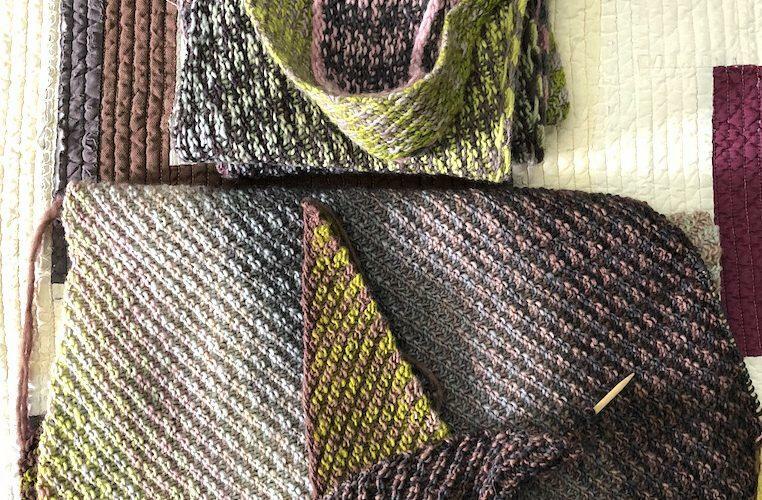 Cecelia Campochiaro’s Parallelogram Scarf calls for a cast-on of 101 stitches and instructs you to knit away in the lovely textured pattern, happy as a clam, until there is just enough yarn left from two Shawl Balls to bind off. That’s what I did when I made my first Parallelogram Scarf, and these are the dimensions I got. Width: 7 1/2 inches. Length: a whopping 122 inches. That’s a very long scarf. I gave it to a small, stylish friend who winds it around her neck many times until it looks like her head is popping out of a woolly nest of beautiful shifting colors. double-wide and original, Side by side, hanging on the door. It’s a lot of scarf, lengthwise. Of course, you could always stop sooner, but I defy anyone to stop knitting with Tina Whitmore’s lovely merino gradient until they absolutely have to. It’s too much to ask! The scarf is knit on the bias, so the stitches slant, with the result that double the cast-on does not equal double the width. 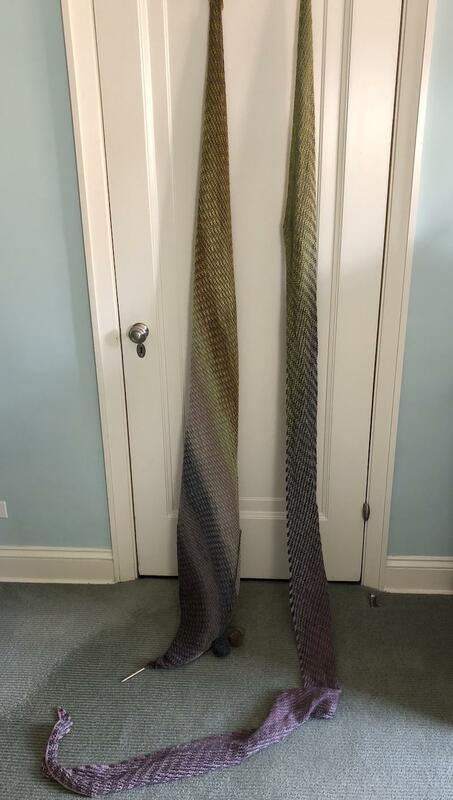 Surely there is a mathematical formula that could predict how wide my scarf would be if I cast on 181 stitches, but I am not that advanced in my math skills, so I just cast on and figured I would find out how wide it was after knitting for a while. I’ve knit on two Shawl Balls until I have perhaps 2 or 3 repeats of the 2-color sequence left to go before binding off, and these are the dimensions I got. Width: 16 inches. Length: 78 inches. I think if I were to do this again, I’d cast on 161. It would still be luxuriously wide, but a bit longer so that it would not be such a close call when worn in the French style. If anybody can use their math to figure out how long and how wide a 161-stitch Parallelogram Scarf would be, answers on a postcard please. (Or just leave a comment. That’s probably easier.) My guess: around 14 inches wide and 88 inches long. Of course, if you use two more Shawl Balls and keep on knitting, as Cristina did, you’ll get a scarf that’s luxuriously wide and long. Numbers aside, this is one of the most satisfying knits ever, at any width and infinite length. You should make one, Ann! It's the season of portable knitting, perfect for Sequence Knitting. You’ve completely rewarded my procrastination – now I’m thrilled I haven’t started my parallelogram scarf yet and get to play with width/length ideas while I finish another WIP! Woo hoo! I’m going to follow the 181 cast on. This is very exciting. My Freia balls are screaming out to me. I have 2 balls of Nautilus waiting patiently thinking I would start one from the inside and the other from the outside. Now I am thinking I should add an Autumn Rose to the party.such decisions so early in the morning. Kay I’m going to do 181 sts using 4 balls of Freia and thank you for doing the math for me. Sarah, please post your progress on Instagram! I’m just getting started on mine, after having to start over, tragically. I’m doing the extra 80 stitches like Kay did, and was planning on using four balls too, but now reconsidering, and just using two. I sure will. I’m about an hour away from finishing the Chevron Hand Towel made with linen mini-skeins that I started at the getaway. Then I’m casting on the Parallelogram. Since I have the 4 skeins already I’m going to use them all. I like a big scarf! I’m planning to do this with the 181 stitches as well. 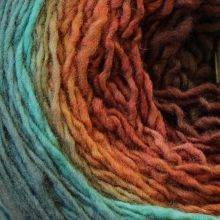 I picked up a colorway sample of Indulgence sock yarn a while back. I’ve unraveled it because the transition yarn was unraveling. I thought it would be fun to use that as one colorway and my varying solid sock yarn leftovers. I love a mystery. I can’t wait to try this. I love a long warm scarf. Thanks for the notes! I love your writing!! If I used a DK weight, it would be even more snuggly! Oh, the choices. That scarf is some fun knitting! I’m in love with mine. I have two embarrassing beautiful balls of Freia that I bought entirely on a whim with no plan whatsoever. They have been mocking me for a year. Now I feel smug and justified and a little prescient. You’re very helpful, thank you!! I was enthralled with this option as I watched you knit at Shakerag. Now that you’ve given me the recipe I’m ready to go with the yarn I bought there. Still working on Corrugated Shawl but Parrallelogram may be next. 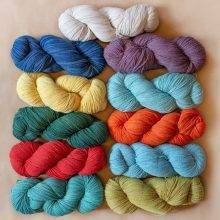 I’m always drawn to color and then design so the Freia Yarn is imploring me to start today. Thank you. Lynn! 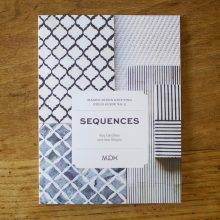 You are the sequence knitting queen! 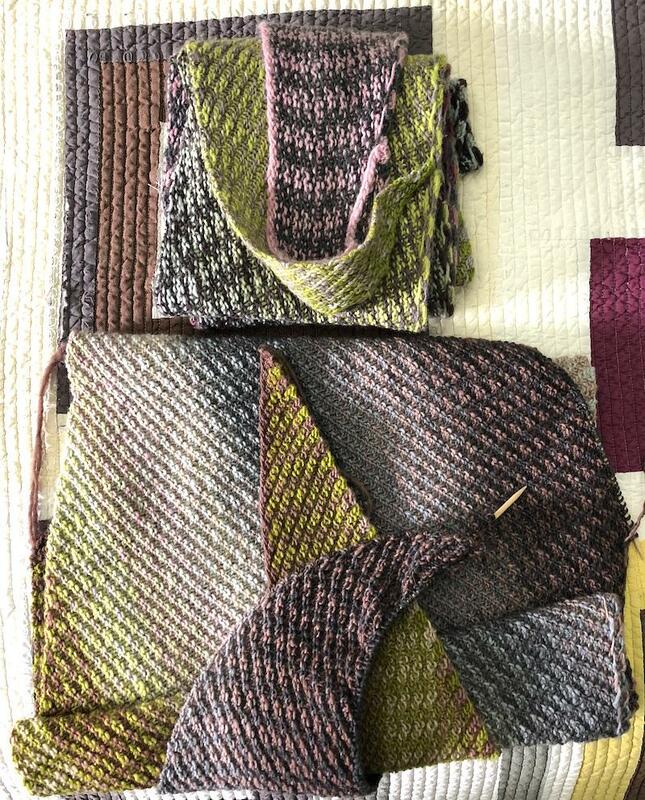 There is a class on bias knitting that Bristol Ivy did on Craftsy. She does explain that math, but sadly was watching only casually on a free Craftsy day and did not get it down. Looking beautifully textured! Wider and shorter is my current style of choice now that Collegiate me is a very distant memory; it also works better with French-style looping, keeping the bulk of the scarf closer to the throat and chest. Currently finishing a cashmere-silk bias wrap because it’s June in California. I see a double wide in my future but a Cashmere-silk wrap? Swoon!! Fellow Cali folks want to know more. Not just California knitters, this Ohio knitter wants more info too! Thank you, knitting math teacher Sarah Jane! I love knitting the scarf nut i screw up and purl an extra stitch and then hv to rip it out! I guess i shd slow down knit slower. Anyone hv my problem? 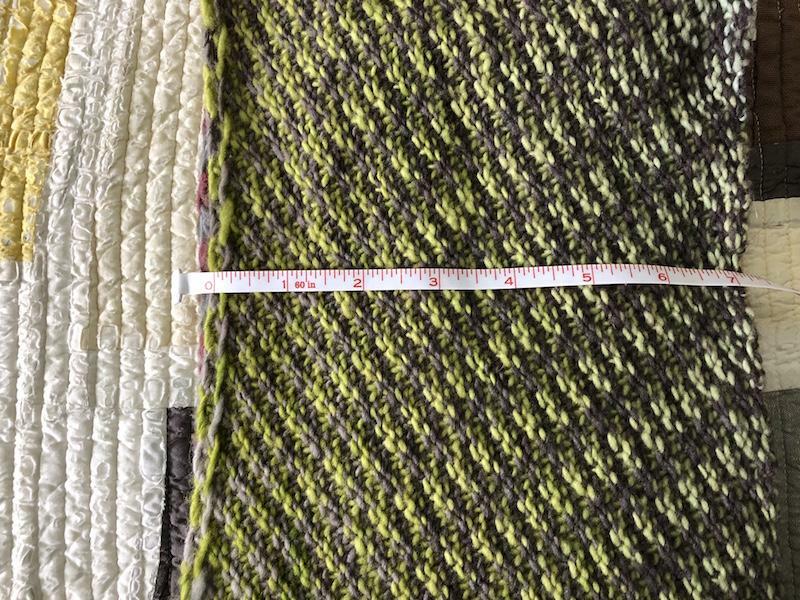 Your gauge changed between the two scarves (original = 4.2 st/1″, double wide = 5.3 st/1″) so given an average of the two gauges, 161 sts would be around 13″ wide. Those gentle color combinations and shifts are so beautiful. I can imagine how much fun this is to knit! I am knitting mine with Freia gradients in turquoise and lime green… i cast on 131 stitches. I love the texture of the diagonal stitches. I love knitting on it. I have only done 8 ½ “ so far. 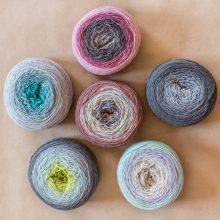 I have 2 Shawl Balls waiting for me to have time to knit this, so this is good-to-know info! Ok, I’m confused. Where is the pattern? Other than cast on so many stitches and it’s a k2, p2 repeat, I don’t find anything on increases or decreases for the ends to make this a diagonal pattern and color shift. Would someone please send me the pattern? http://www.facebook.com/SaraLWaterbury thank you. I still can’t find the written instructions. It says cast on so many stitches, and length when finished. I’ve seen k2, p2. But how does it make the tapered ends and the pattern at a diagnal? I’ve seen used 2 balls of a different color to get the wonderful ombre effect but it doesn’t give instructions how. No matter where I’ve looked. Would someone please send me a PDF of the pattern please? [email protected] thank you! Happy Holidays! Sara, I don’t know if anyone answered your question but the pattern is in MDK’s Field Guide No. 5, Sequences. I am just beginning this scarf and am reading the pattern in Sequences Field Guide. How do I bring along color A when I join color B?